Seems just yesterday simple Jane’s heart kept perfect time. Ticking, never losing a beat. Days seemed good. Nights seemed hopeful. McDonalds was big at on end of town, KFC at the other. Frosty Freeze in the middle. On the outskirts of town, Lucky’s Bar stayed alive into the wee hours. Biker guy liked her. Told her she was pretty, deserved wind in her hair. She bought it. He delivered it. Both regretted it. He biked down to Mexico. She hitched into NY. Wrote home: I’m a Kelly Girl! Life remained livable, even with her heart still roaming, exposed and vulnerable. Then, Burt came along. Young, educated smoothie. Wall Street predator by day, trophy hunter by night. Simple Jane, unfortunately got in his sights. One night. Two nights. No nights. 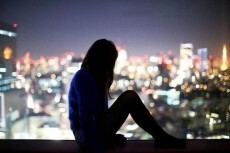 Atop her apartment roof, that place all the lonely people frequent, she visited every night. Lights of the city meant something. She didn’t know what. Hers was a wounded heart. Plain Jane knew it, far too many others as well. Still, finally, she found some special moments of rest. Time wound her back up. More ticking. Important ticking. Love ticking. Until it didn’t. Tag on scruffy mutt’s collar said Reggie, another frequent roof visitor. Gave her licks and wags. He crouched beside her, watched the stars together—every night. ‘til the winter snows came. Reggie still visits the roof. Wanders about sniffing. Can’t find plain Jane, but when he lies down at the edge of the roof, some say her reflection is still there in his eyes. This is so sad, Odin, but true. Where people might just use you, abuse you, abandon you to loneliness and despair, the love and friendship once given by an animal lasts. They just don't seem to know the concept of duplicity. And if I got this all wrong, sorry, that's just what it says to me. You got it right. The "Dogs" series on Netflix is really well done and posits your thoughts as well. This page was created in 0.3284 seconds.